Top » Catalog » Game Specific Products » Star Trek: The Next Generation » STNGKBOPr Bookmark Us! 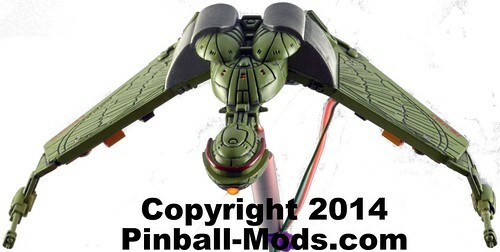 A Hallmark 1994 Klingon Bird of Prey for your Star Trek: The Next Generation Pinball Machine. This ship is "bolt on ready" and comes with wiring harness for easy installation. 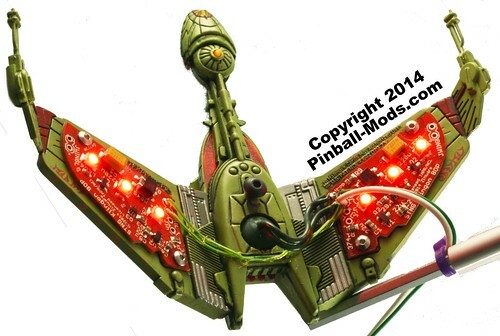 The WingLED board drives the ship with necessary current limiting to drive all internal-to-ship LEDs. Gun port and engine blink; body of ship lights a solid red (bottom) and white (top). Comes with mounting screw to attach to your existing bracket. Simply unplug your existing ship and plug this one in - that simple. and a #8-32x1/4 button head screw for mounting to your existing wireform. These are representative pictures of the ship you are purchasing. Each Ship is hand assembled; so they may vary in connective wiring. 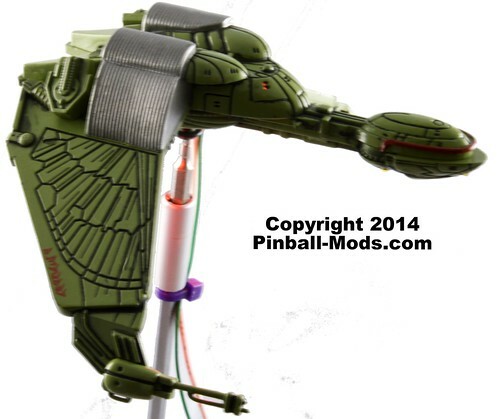 Please note that this Hallmark ship are intended to be installed in a stock 6.3VAC GI on the STNG pinball machine. This product is not compatible with the 9VDC outputs of the OCD product. Please see this thread for possible solutions. Notify me when "STNG: Klingon Bird of Prey" is re-stocked.